What good fortune that the Netherlands arrived right at Christmastime! I love it when there's a seasonal connection for the meal, and better yet when it matches our own weather: the Dutch kerstfeest is definitely designed to keep you warm and well-fed while also bringing the cheer. 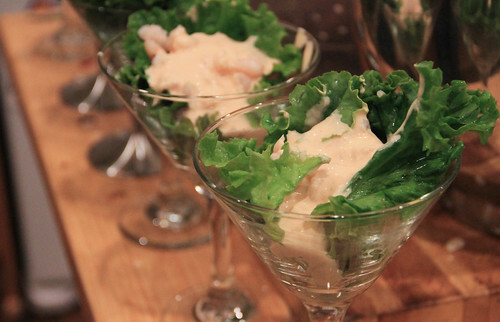 Also, I just realized, every bit of food was soft, save for the lettuce garnish on the shrimp cocktail. 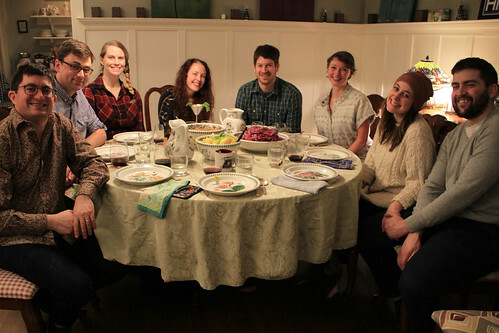 Our guests for the festive evening were Kale, Rachael, Elena, Michael, Haley, Chelsea, and Al. I saw a few places mention that shrimp cocktail is a classic way to begin a Dutch Christmas meal, and apparently Dutch grey shrimp are really tasty. Since I couldn't find them here, I used standard shrimp, so it's the sauce that made the dish distinctive. Whereas I'd think of a cocktail sauce as being essentially mayonnaise with stuff mixed into it, this recipe is made with partly whipped cream; while it sounds exciting that it's got some whiskey in it, I could barely notice. It was fine, I guess, though the flavor wasn't interesting enough to be worth the effort, and a "good dollop" of sauce as the recipe recommends was too much. Snert! What a fun word to say. You could also call it its more formal name, erwtensoep, but we're among friends who like to giggle at food names, so, snert it is. 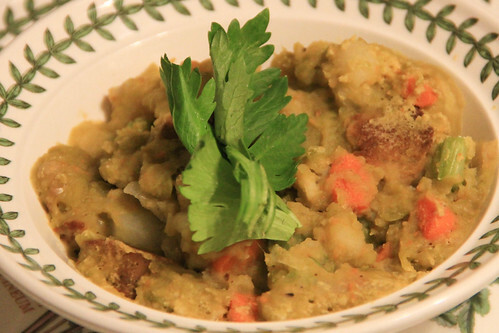 Pea soup is always thick and hearty, but this was definitely the thickest and heartiest I've ever had. It's got a bunch of vegetables that survive the winter plus pork, cooked until it's so thick a spoon can stand straight up in it, and topped with slices of a sort of smoked sausage that's apparently similar to kielbasa. Apparently, snert is the food that traditionally follows ice skating. I'd definitely enjoy something this warm, filling, and rich after some exertion in the cold! Sometimes I find that rabbit turns out like stringy chicken for a few times the price. 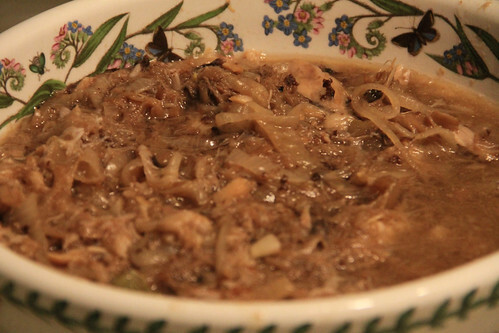 But this traditional preparation treats the rabbit right: a long marinade in vinegar and spaces, followed by browning and then a long simmer (in a Dutch oven, naturally!) with a sweet apple syrup that's super easy to make yourself. Tangy, aromatic, and a bit sweet. Perhaps the best dish I've ever tasted with rabbit! 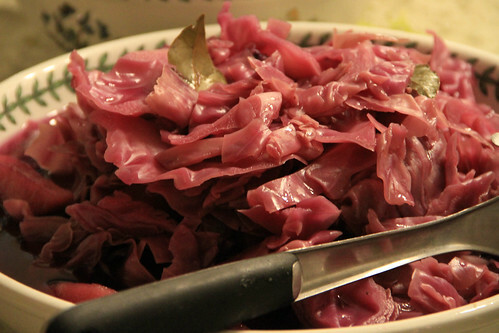 The vinegary red cabbage dish common to a huge swathe of Europe. The tang and mild sweetness felt a bit redundant with the rabbit, but the slight crunch was welcome. 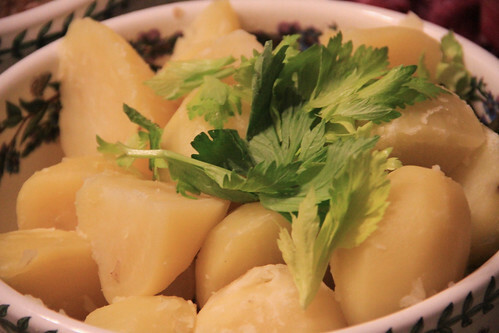 Plain peeled, boiled potatoes are a super duper common part of a Dutch meal. Vla is just on the pourable side of the continuum of custard thickness; it typically comes in bottles or cartons, rather than jars or tubs, in the store. It's not a coincidence that the name is similar to its firmer cousin, flan. They both come from the same root as the English word flat, though if you asked me to come up with a list of adjectives describing custard desserts, it would take me quite a while to get to "flat!" Anyway, this was tasty! The process was like making a vanilla ice cream base, just with whole eggs instead of just yolks, and some cornstarch. 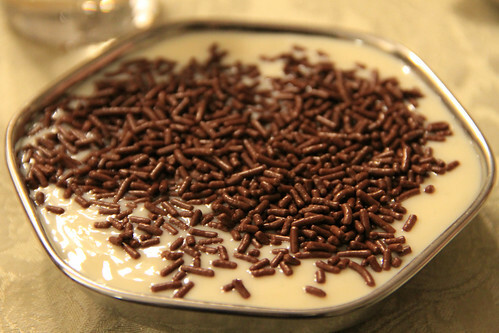 The best part was topping it with hagelslag — the literal meaning is "hailstorm," but it's actually the Dutch version of sprinkles, in this case chocolate. (Thanks, Laura D., for sharing part of the Christmas gift from your Dutch host family!) They're not coated in shiny stuff like sprinkles here, so they're a bit softer, and in case they're frequently enjoyed on top of buttered bread. But in our case, they added color, texture, and a little flavor to the vla. 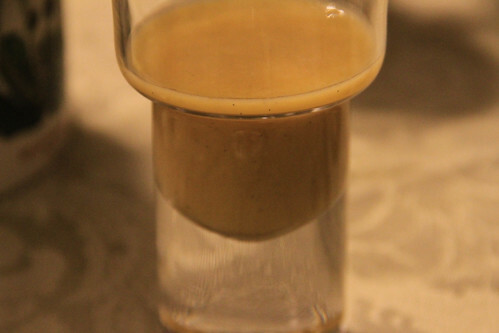 If a pourable flan sounds strange to you, how about an eggnog you eat with a spoon? Advocaat is the thick, rich, Dutch answer to egg nog. There are two theories about the name: one is that, since advocaat means "lawyer," the thick and smooth drink was used as a vocal lubricant before a court argument. But advocaat also means "avocado," so the conjecture is that colonists had enjoyed avocado blended with rum in the tropics, and this drink was a pretty clever approximation of the texture. As an armchair etymologist, I find the latter slightly more probable. Despite the purportedly colonial origin of the drink, there's no hint of the country's spice-trading history in the form of nutmeg or cinnamon as there is in the egg nog we know, so the quality of your vanilla and brandy are very important. I only had cognac in the house and not enough time to run to the store, so this was a pretty darn good advocaat!